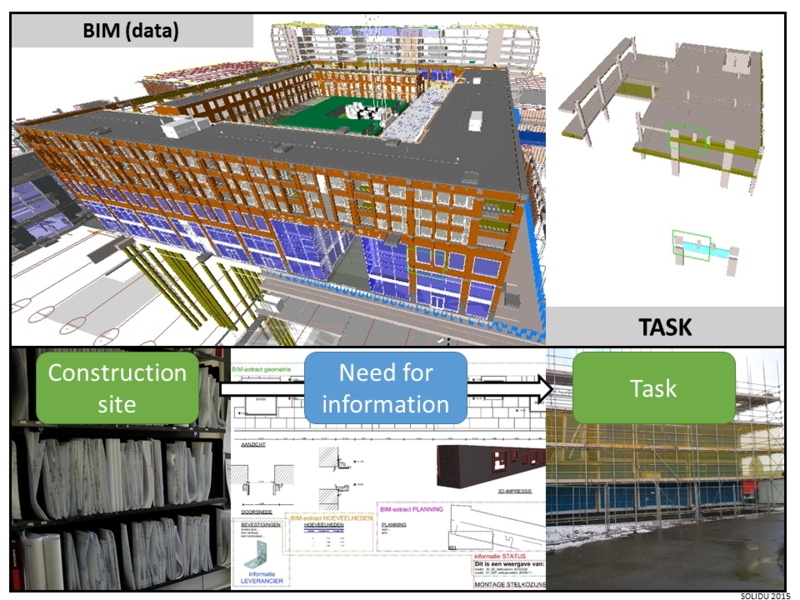 Challenge: BIM on the construction site: generating information from BIM on paper | AECHack - let's build the future now! There is a printer in every office on the construction site and there are even more computers, tablets and what not. New technologies bring BIM to the construction site using these computers, on the other hand traditional drawings can still be found on the construction site for the use of construction workers. The information on the drawings is the same as the information that was put on before BIM technologies came around. There is a strong need for an easy tool that is capable of viewing data the way construction workers want (and need)! Relevant information for construction workers can be found on different drawings. This data is also available in BIM. The information contains sectioning's and floorplans with annotations. The perspective view of objects can be helpful as well. Nowadays modern CAD applications are capable of creating drawings from BIM, but these programs are built to design and have the capability to create drawings as a small feature. Use models (ifc) which are relevant for a specific task in an application to view the relation between different objects involved in a task on the construction site. Generate a sectioning, floor plan and perspective and be able to add measurements and other annotations.